Lots of seasonal events and performances for everyone. 5 different areas available for performances. Check out the calendar for today's events! Overview: Do you like music, comedy, theater, holiday gatherings, and dancing? Then you need to check out the happenings at the Warren Station at Keystone. The 7,200 square foot community performing arts center is dedicated to bringing guests and residents year-round entertainment. From the east side of the River Run Village, the Warren Station will put on concerts, theatre performances, art shows, kids and family activities, non-profit functions, weddings, and private corporate functions. Where: The River Run Village is among the group of areas managed by the Keystone Neighbourhood company at Keystone Resort in Colorado. The River Run Village celebrates its events at not only the Warren Station but also at the River Run Events Plaza, the Quaking Aspen Amphitheater, Buffalo Courtyard, and the Silvermill Courtyard. 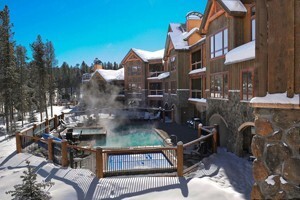 all venues are located with the River Run Village in Keystone. Fees: Most events are free, some will have a small entry fee. Beverages and food vendors are usually present at events for purchase. Details: Find the latest event calendar on the Warren Station Center website.